A Gathering to Share a Meal and our Thoughts. The past few months have been increasingly filled with voices that polarize and isolate, encouraging anxiety and mistrust, fostering fear of “others,” of strangers … and now, the unthinkable has happened — six of our fellow Canadians, Muslim men at prayer, were gunned down. Since then Jewish cemeteries have been defaced, and threats of violence have been made against Muslim students at a Canadian university. See details re speakers and agenda below. Questions or to volunteer, see the form below. Download a PDF of the agenda and bios of speakers. 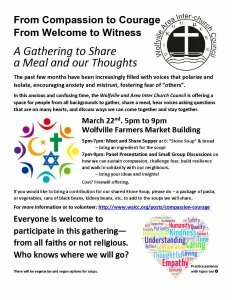 In this anxious and confusing time, WAICC—the Wolfville and Area InterChurch Council—would like to offer a space for people to gather, share a meal, hear voices asking questions that are on many hearts, and discuss ways we can come together and stay together in the midst of it all. 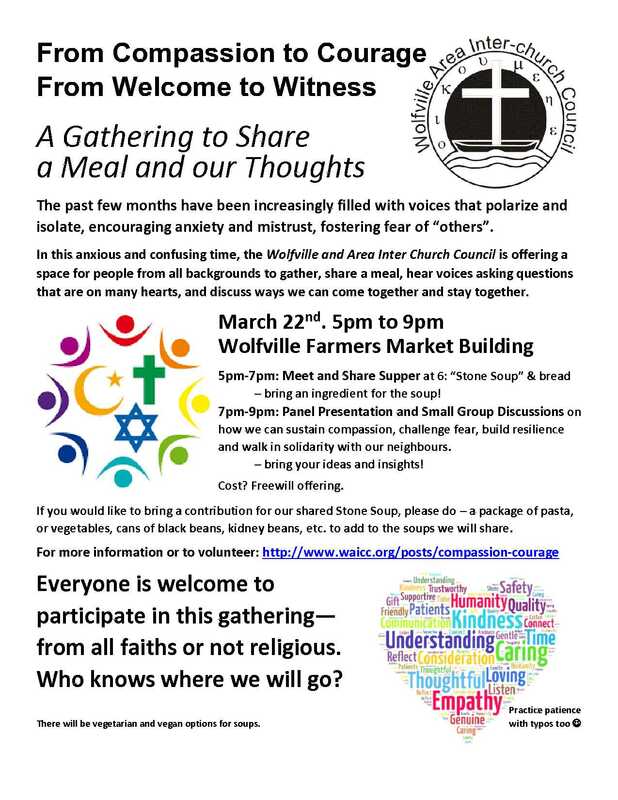 Wednesday, March 22, 2017, 5pm-9pm at The Wolfville Farmers’ Market. Come at 5pm with an ingredient for our Stone Soup, meet one another, share a soup supper at 6pm. At 7pm, the more formal part of the Gathering will begin with speakers sharing how we can sustain compassion, challenge fear, build resilience and walk in solidarity with our neighbours. Small group discussions will follow. Cost? Freewill offering to cover expenses. Everyone is welcome to participate in this gathering—who knows where it will take us? Anna Robbins: How people of faith or goodwill find or make meaning in the midst of this situation? How do we understand and practice empathy and compassion? Suzanne Handley is a teacher and writer who lives with her family on a farm in Berwick. She teaches grade 7, 8, and 9 Social Studies and French. Suzanne also writes novels, two of which have been published, with a third currently in the works. All her books deal with questions of faith, identity, and self-knowledge. Suzanne has been a part of the Wolfville Muslim community since 2004. Andrew Biro is a professor and head of the Politics department at Acadia University. He is also affiliated with Acadia’s graduate program in Social and Political Thought, and the undergraduate program in Environ-mental and Sustainability Studies. His research and teaching interests are in the areas of environmental politics, critical theory, political economy, and politics and the media. Robin McGee is a Registered Clinical Psychologist, mother, wife, educator and friend. Living in Port Williams, Nova Scotia, she has been a dedicated clinician in health and education settings for over 25 years. She has worked in public mental health services, is currently a consultant with the AVRSB, and has a small private practice. She is a recipient of the IWK Award for Outstanding Practice in Clinical Psychology. Anna Robbins serves as Associate Professor of Theology, Culture and Ethics, and as Vice-President of Acadia Divinity College in Wolfville. In 2000, she was appointed to the faculty of the London School of Theology, teaching theology and contemporary culture and was involved, as theological consultant, with several organizations in the UK, including Theos, Christians in Politics, Tearfund, and the Evangelical Alliance. Anna speaks and writes widely, with a passion to help people to engage matters of contemporary culture and faith.